In our last episode, we talked about the differences between parameters and parameter values and between acoustic and electronic parameters. We also discussed envelope generators and the relationship between harmonics and timbre. 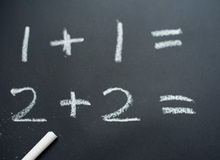 Now let’s look at the most essential parameters for oscillators, filters, and LFOs. Instead of producing sounds by vibrating like physical objects, synthesizers produce electrical signals. To hear them, you must amplify those signals and then convert them to sound by making a speaker vibrate. Just like the vibrations that acoustic instruments produce, signals produced by synthesizers have frequency and amplitude, which we perceive as pitch and loudness. When harmonics are combined, a single cycle of the resulting sound is called a wave. Every wave has a distinctive shape, called a waveform, which you can view on an oscilloscope or when you zoom in an audio editor’s waveform display. Conversely, every waveform has a distinctive sound that’s determined by its particular combination of harmonics. Every synth has at least one primary source of audio signals called an oscillator. Audio oscillators generate signals ranging from basic waveforms to sampled recordings, depending on their design. Most synthesizer oscillators have a knob, a switch, or buttons to select from the two, three, or four basic waveforms—sawtooth, pulse, triangle, and sine—that we most often associate with analog synthesizers. Some waveforms are rich in harmonics, and some are missing specific overtones. The simplest waveform is a sine wave, which contains only the first harmonic (also called the fundamental) and no overtones. A triangle wave has a strong fundamental and weak overtones, with no even-numbered harmonics. Sawtooth waves sound much brighter because they contain both odd- and even-numbered harmonics. Pulse waves contain only odd-numbered harmonics, but they’re stronger than they are in triangle waves. By altering the shapes of those basic waveforms, you can change their harmonic content. You’ll do this most often by varying the width of pulse waves. It helps to picture a pulse-wave oscillator as a switch that’s turned on and off very quickly. 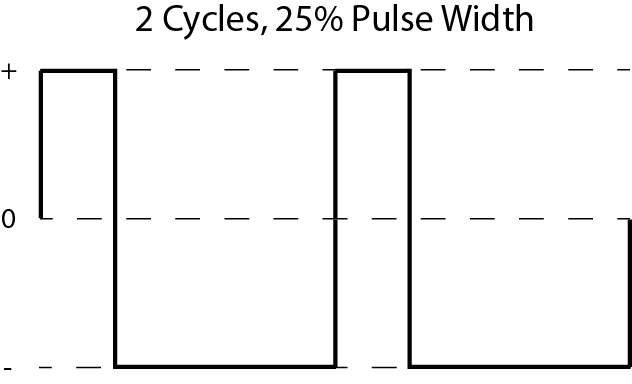 The pulse width is the portion that’s on, and it’s expressed as a percentage of a complete cycle. If the pulse width is 50%, we call it a square wave, resulting in a sound typically described as hollow and clarinet-like. A square wave is nothing more than a pulse wave with a 50% pulse width. If a pulse wave is “on” for one-tenth of a cycle, its pulse width is 10%, and if it’s “on” for three-quarters of a cycle, its pulse width is 75%. 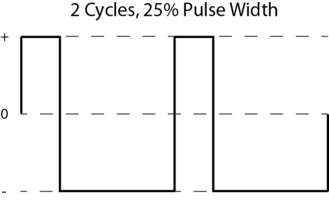 Pulse width is a parameter you usually control by setting its value with a knob. You can also change the width (and hence the spectrum) in real time by modulating it with an LFO, envelope generator, or any other modulation source. Some oscillators let you modulate the shapes of sawtooth and other waves, as well, which also varies the spectrum and hence the resulting sound. Most oscillators have two knobs for controlling frequency. One lets you specify coarse tuning—often by choosing the octave—and the other lets you fine-tune the frequency. Fine-tuning an oscillator is a lot like tuning a guitar. In addition, some synths have a switch to sync the oscillators. When two oscillators are in sync, every time a wave from one oscillator completes a cycle and begins a new one, the other one begins a new cycle at the same instant, regardless of whether it has completed its previous cycle. With oscillator sync engaged, modulating the second oscillator (with an envelope generator or LFO, for example) will change its harmonic content, but not its pitch. Instead of layering harmonics to create complex waveforms, most synthesizers let you apply a filter to harmonically rich waveforms to reduce, remove, or even emphasize certain harmonics. Filtering complex waveforms is the basis of subtractive synthesis. The far most common type of filter is a lowpass filter. It passes all frequencies below and up to a specific point called the cutoff frequency (or simply the cutoff) and gradually rolls off (or attenuates) frequencies higher than the cutoff. You can use a knob or slider to control the cutoff frequency, or you can modulate it with a signal from an envelope generator, LFO, or other modulation source. By changing the cutoff, you can continuously alter the oscillator signal’s harmonic content as it passes through the filter. Turning the knob all the way down closes the filter so that nothing passes through. Slowly turning it up allows more and more harmonics to pass through as you raise the cutoff frequency and the sound grows brighter. Turning it all the way up opens the filter so that nothing is attenuated and all audio passes through. Lowpass filters have at least two controls: one for cutoff and another for resonance. Resonance boosts the amplitude of audio signals at or near the cutoff frequency, emphasizing any harmonics close to the cutoff frequency by feeding them back to the filter. It also exaggerates any changes to the cutoff frequency—when the cutoff is being controlled by a modulation source, for example. Another filter parameter you should be aware of is slope. Slope is the angle of the filter’s rolloff and is expressed in decibels (dB) per octave. Filters either have fixed slopes, or you can switch between two or three different ones. The most common slopes are 24 dB per octave (making it a 4-pole filter) and 12 dB per octave (making it a 2-pole filter). Traditionally, synthesists associate 4-pole slopes with Moog filters and 2-pole slopes with Oberheim filters. Low-frequency oscillators (LFOs) are modulation sources. Like audio oscillators, LFOs produce repeating waveforms, but normally at frequencies below the threshold of human hearing. Instead of producing audio signals, their signals change the way audio signals sound. Synthesizers route control signals from modulation sources to modulation destinations such as oscillator frequency, pulse width, and filter cutoff. Envelope generators are also modulation sources. When you modulate oscillator frequency with an LFO producing a triangle wave, the resulting pitch rises and falls at a constant rate. If the modulating signal’s rate and depth are just right, we call this kind of modulation vibrato. Acoustic performers use vibrato to make their playing more expressive, often with a shaking motion as their fingers apply pressure to a string. Much as a singer’s vibrato gently fluctuates vocal pitch, a synthesist routes an LFO to modulate oscillator frequency. Most LFOs generate more than just triangle waves and also offer square waves, sawtooth waves, and sample-and-hold (a kind of random signal generator) as modulation sources. You can modulate oscillator frequency with a square wave to produce trills, and modulate oscillator frequency with a sawtooth to simulate ray guns, alarms, and other repeating sound effects.